The beautiful Sohni and her cowherd lover, Mahiwal, have been immortalized in the verse of Fazal Shah, who lived in the eighteenth century during the reign of Maharaja Ranjit Singh. 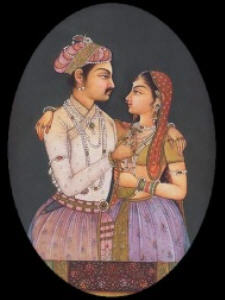 Their story belongs to a time of Indian history when chivalry was at its peak and silver and gold were found in plenty. At this time when trade was at its height, a man named Izzat Beg, a young aristocrat of Bukhara, came to India and chanced on the home of the potter, Tulla, who was famed for his fine craftsmanship, and his daughter Sohni, who was equally deft at making clay vessels. While looking at Tulla's beautiful creations, Izzat Beg saw Sohni at work, painting a pot. A glimpse of her startled Izzat Beg so that the most expensive bowl he was holding slipped from his hands shattering into a hundred pieces. His discomfiture caused a spontaneous gale of laughter from Sohni. Another look at her, and Izzat Beg lost his heart. He started visiting the potter's house every day on the excuse of buying the fine pottery, leaving Sohni to wonder how he could carry so much of the fragile ware back to Bukhara. As the two fell deeper and deeper in love with each other, Izzat Beg's fortunes dwindled for he was idling his time away, lost in love. Meanwhile, Sohni's father, Tulla, brooking no protests, forced Sohni to marry another man. Though now another man's wife, Sohni had given herself to Izzat Beg and did not accept her husband. Having lost all his fortune, Izzat Beg started looking after cattle, and the aristocrat of Bukhara, now became the cowherd, Mahiwal. Every night Sohni used to cross the river Chanab using a large baked earthenware pitcher as a float, to meet her lover, Mahiwal. One day, her sister-in-law found out about these clandestine meetings and determined to avenge her brother, replaced the earthenware pot with an unbaked one which would melt halfway in the river. As was her wont, that evening, Sohni picked up the pitcher and realized it was the wrong one. But she could not keep her lover waiting for her, and using that pitcher to help her stay afloat she started swimming across the river. The stars were against her, for that night, there was a fierce storm, and the unbaked clay pitcher dissolved midstream, causing Sohni to drown. Seeing her struggle in the swirling waters, Mahiwal jumped into the river and the current swept them both away, the lovers passing into legend.